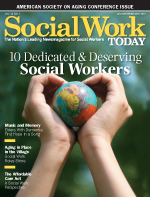 Each year Social Work Today asks its readers to nominate colleagues, coworkers, and mentors by writing essays about why these people should be included in its annual recognition of “10 Dedicated and Deserving Social Workers.” We were delighted by the essays submitted and are honored to select 10 individuals’ stories to share with readers. We know that many more of you deserve recognition for your tireless efforts, and each year it gets more difficult to select our 10 finalists. We are excited to share these 10 stories with you here. Many influences in Susan Auman’s early life pointed her in the direction of social work. In high school, Auman was a self-appointed school bus bully monitor, making sure other students weren’t targeted. While it seemed that she was destined to become a social worker, Auman started in the marketing track in college and initially pursued that career path. In the mid-1990s, after falling in love with an Italian man and moving to Rome, she became acquainted with a social worker who recognized her natural affinity for helping others. She went from helping the social worker run some groups to facilitating groups on her own. That ultimately put her on the path to a social work career, and Auman eventually returned to school for her MSW. Prior to being deployed to Iraq, R. Jeremy Harrison was pursuing an MSW so that he could become a school counselor. At the time, he was a family-based mental health counselor. After a year overseas, Harrison was a changed man. He returned to his counselor role, but his point of view had dramatically changed. Harrison recognized that he viewed his clients’ trials as minimal after what he’d seen in Iraq and, realizing he was no longer the best person for the job, he resigned. When Harrison went to the Veterans Center to talk about some of his readjustment issues, he learned about a new program that would be hiring returning veterans as outreach coordinators. He got a job as a coordinator and returned to school to complete his MSW, graduating in 2007. While using his social work skills to help other veterans, Harrison also has generously provided training to social workers and other professionals to help them understand the special circumstances and needs of veterans and their families. He wrote a novel loosely based on his experiences in Iraq. The Warrior Citizen: A Soldier’s Journey to Iraq and Back mirrored many of his experiences with the hope of helping others understand the veteran’s experience. But it’s also been those stories that have inspired him. Harrison says he will always remember one particular World War II veteran with a disability and severe PTSD. He wore dark glasses and could never enter Harrison’s office without the lights being dimmed. He had no income and was living with his father. Though he’d been to other counselors and tried treatment through the VA, he told Harrison that nothing had helped. Harrison began working with the man individually on a weekly basis and also referred him to group therapy. As a veteran with a disability himself, Harrison could walk with the WWII vet through the insurance process and the appropriate disability paperwork. Eventually, the veteran stopped wearing dark glasses, became sociable and talkative, and his disability was determined to be 100% service connected. Since graduating from college, Holderman has worked in hospice as well as an inpatient physical rehabilitation unit. In her current position as an admissions coordinator within the VA system, she is known as the gatekeeper. She’s the front line staff for residential treatment, and every patient who seeks treatment has to go through her first. In a rural area of Minnesota, addressing the complex needs of people with mental health challenges who are overutilizing the emergency department required a collaborative approach. Working together, the local hospital, Steele County social services division, and county-based purchasing health plan undertook the problem, creating an “in-reach” position that Elizabeth V. Keck fulfilled. Since taking on the role, Keck has overseen successful changes to the systems on a macrolevel as well as provided results for the individuals with whom she’s worked. It has been a good fit for Keck, who realized she had a heart for helping others as a college student. Keck admits that having several agencies involved with the program brings challenges of its own. There are many rules and regulations as well as more than one governing body to which she must answer, but she says the program has been so successful there’s increasing interest from other agencies and facilities wanting to implement a similar program. Langley started in medical social work, working in emergency departments and other hospital settings. Ultimately, she got involved in mental health. She currently supervises five marriage and family therapy interns and a master’s-level social worker. She also maintains a private practice and does additional work in group homes, foster homes, hospitals, and administrative areas. As the man’s condition worsened, it was obvious his time was near. Though this particular hospital did not allow children to visit patients in the ICU, Langley advocated for permission to have the three children see their grandfather one last time. Each donning gloves, a gown, and a mask, the children had some incredibly heartwarming time to reconnect with their grandfather. About a week later, he passed. In college, Eric Mayfield loved his psychology classes, but he knew he didn’t want to spend eight years working on his PhD. So he was grateful when an advisor steered him toward social work. It had many of the elements of psychology that he loved and gave him the opportunity to help others. Since entering the field of social work, Mayfield has worked in several different areas; he loves the versatility of his career. Mayfield divides his time among three clinics and often has long hours, but the patients make it worthwhile. And it’s not always easy when patients pass away, but Mayfield has witnessed the triumph of a patient who gets a long-awaited kidney transplant. “The joy that comes in seeing a long-time dialysis patient get the opportunity to have their life back is phenomenal,” Mayfield says. As a medical social worker, Denise McBain habitually goes above and beyond what is expected of her. She has led an initiative to standardize documentation across the St. Louis SSM network, assisted in creating documentation defining unwritten communication expectations within the case management and social work departments, and developed checklists for new employees and as a guide to practicum students. But of all these accomplishments, her efforts to establish an Optimizing Medical Management for Ventilator Dependent Patients workgroup stands out. The work is geared toward supporting families of patients on ventilators, considering resources are limited for long-term ventilator patients. Suzanne Pritzker was an undergraduate history major when she became interested in how policy can be more inclusive and representative of what is really happening with individuals and communities. As a professor teaching policy to her social work students, Pritzker is passionate. In particular, she’s passionate about how social workers can make changes in public policy and their surrounding communities. Her students witness that Pritzker practices what she preaches by participating in projects and community efforts that benefit everyone. For Laurie Ray, social work was a career change. As a pet therapy volunteer, she wanted to find a way to make that work more mainstream. She decided social work was the answer and returned to school for her MSW. COPE Eldercare was established to bring compassionate geriatric care management services to older adults and their families. Ray says it has been eye-opening to see who needs help. She frequently works with individuals with dementia and is amazed to see an increasing number of clients who are trying to manage this diagnosis at a young age. “We do a support group for individuals with frontal temporal dementia and find that young adults who have been diagnosed is where our practice is growing,” she says. While pet therapy isn’t a primary focus for COPE, Ray still does it on the weekends. It was, after all, her introduction to the field of social work, witnessing how one person can have a tremendous impact on others’ lives. Joanne Sizemore admits she didn’t grow up thinking she’d be a social worker. She envisioned following in her mother’s footsteps and becoming a teacher. But a day of substitute teaching while in college convinced her it wasn’t the right career path. Still, having grown up watching a mother who taught in one-room schools for many years tremendously impacted Sizemore, believing this led her into social work. Sizemore currently works with the Department of Public Advocacy, which requires devoting her time to clients facing criminal sentences and often struggling to meet basic needs. She works with attorneys and judges through the court system, which is quite different from the previous 17 years she spent in community mental health as a program director for an in-home counseling program. She supervised a clinical staff and worked with high-risk families and now brings that experience to her current public advocacy work. In her position, Sizemore has utilized a variety of skills, including assessment, resource location, and counseling. She also has briefly worked with clients’ family members. “It’s been an opportunity to use skills I’ve gathered from other jobs and experiences,” she says. Like her previous job, it means dealing with some tough cases. But Sizemore says the feeling she gets when she’s positively impacted someone’s life keeps her energized.